I had no reason to be in Spokane other than to meet him. 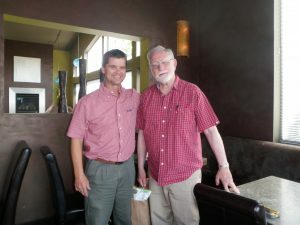 With no relatives in eastern Washington and no business purpose for driving eight hundred miles (one-way), I was hungry to meet this master humor writer. He bought me lunch. The man had me in stitches at hello. My feature entitled “Eighty year old Patrick McManus Still Hunts for Laughs” is one of his last interviews. Patrick McManus passed away April 11, 2018. America has lost a gem. The Mark Twain of the Northwest has laid down his pen. For more tributes read these pieces from the Spokesman-Review (Spokane, WA) and the Minneapolis Star-Tribune. For more stories visit the Etc. Guy Facebook page. This entry was posted in Humor Project - Interviews, The Humor Project and tagged american humor, humorists, mark twain, outdoor humor, Patrick McManus. Bookmark the permalink.